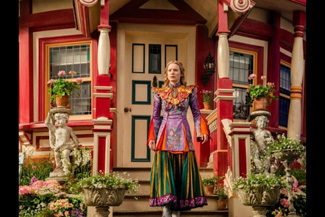 “Everyone lets go of everything eventually,” says Time to the titular character in Alice Through the Looking Glass, and Joe Roth would have been wise to internalize that line in the screenplay when deciding whether or not to greenlight a sequel to the least-beloved billion-dollar grosser on the books. But it does no good to assess the merits of an Alice in Wonderland follow-up in theory; it exists here and now, and must be dealt with. And it is a perfectly average thing, through and through: the most mechanical essence of a studio ethos that excels at mechanical profligacy. I liked it better than the original, which was a grotesque fever dream in search of a story, and that's something; this entry takes the overwrought and unpleasant visuals and adds enough texture and symmetry to at least make the copious exercises in set design and CGI intriguing, and occasionally even a little beautiful. This does not distract us from - indeed, it more or less fixates us on - the fact that we are witnessing a demo reel instead of a story. There’s little pathos or catharsis to the character drama, and each scene mostly evaporates the moment it’s over. The movie does well enough by its opening, which places Alice Kingsleigh (Mia Wasikowska, returning from her debut leading role) as a sailor on her late father’s merchant ship; upon returning to London from China, she realizes that what remains of her father’s estate has been sold off to her ex-fiance; her mother, it turns out, has brokered the deal. During much of these early developments, our attention keeps turning away from the principals and toward a strange blue butterfly that appears to be following Alice wherever she goes; she takes notice of it eventually and follows it through an enchanted mirror and into Underland (this franchise’s re-christening of Wonderland).